The firm was established over 35 years ago and serves as general counsel to global enterprises, as well as regional and local businesses, professionals and individuals. From its inception, the firm has been result-oriented and dedicated to providing high quality professional services to its clientele, which includes Pacific Rim and European based companies, as well as individuals and professionals. The firm has established a sound reputation for reliability and excellence. Mr. Teraoka and the law firm have earned an AV rating from Martindale-Hubbell, the 100-year old attorney rating system. An AV rating is the highest category for superior legal skill and integrity. In addition, Mr. Teraoka has been recognized as one of the top 5% of attorneys in Northern California, having been honored as one of the "Super Lawyers of Northern California" for 2008, 2009, 2010, 2011, 2012, and 2010 The firm emphasizes the following areas: - - Corporate and Commercial Practice - Establishing United States Subsidiary Offices - Business Litigation - Mergers and Acquisitions - Employment and Personnel Matters - Real Estate - Business Immigration and Visa Matters - Licensing - International and Domestic - Public Utilities Regulation of Transportation Matters - Hi-Tech Representation - Alcoholic Beverage Control Licensing - Intellectual Property Matters - Estate Planning, Probate, Wills and Trusts The firm consists of experienced highly trained attorneys along with trained, capable and experienced legal staff assistants. The firm's attorneys serve as general counsel to large and closely-held companies. They advise on most legal affairs affecting businesses, including incorporations, joint ventures/partnerships, limited liability companies, corporate-subsidiary issues, contractual relationships, distribution agreements and arrangements, administrative problems, commercial collections, real estate, commercial leases, broker liability, securities regulation, employer-employee matters, immigration matters, licensing, transportation issues as well as acquisitions. Through the firm's of-counsel association, the firm's clients have access to experienced patent and trademark counsel, estate planning and business litigation expertise, as well as legislative counseling in California regulatory matters. Teraoka & Partners LLP is dedicated to obtaining results for client satisfaction. It has worked with and has been at odds with the largest of law firms on various litigation and transactional matters in the State of California. It has handled major litigation that impacted California public utility deregulation of specific common carriers. Because of its size, a client knows the attorney working on a case and is assured that his/its case is receiving close personal attention. The attorneys strive to build close advisory relationships and to work in a positive supportive capacity with clients. It provides advisory information and services to assist clients in making good, timely decisions for success in dispute resolution and in enterprising endeavors. These qualities make Teraoka & Partners LLP a unique law firm serving individuals, professionals and expanding businesses. The firm's Pacific Rim practice serves businesses and individuals throughout Asia, including Japan, China, South Korea, and the Philippines. It has advised both American clients seeking to do business in Asia and Asian clients seeking to operate in the United States. The firm's European practice serves businesses from Germany, France, Italy, Britain and Norway. In particular, the firm has helped many foreign corporations navigate the complex and often confusing regulations imposed on businesses by American federal and state governments. The firm provides Japanese-speaking and reading and writing resources for its clients who have such needs in the course of their business dealings. The Firm's home office was established in 1976 in San Francisco's downtown financial district. In 1992, the Firm established a branch office in Silicon Valley to better meet the needs of its clients in that region. The Silicon Valley office is located in Palo Alto, California. In August 2006, the firm also established a branch office in Los Angeles, California, in Century City, to meet the needs of its growing client base. The Firm will continue to provide excellent professional services in a result oriented and client serviced environment. Our law firm counsels both foreign and domestic companies in connection with immigration and visa issues. We regularly assist our clients to obtain, renew or change the visa status of their employees coming to the United States. We focus primarily on visas in the B, E, F, H, and L classifications as well as Green Card Applications. Our firm advises corporate clients on compliance matters relating to the administration of executive employee visas, and represents corporate and individual applicants before the Department of Homeland Security, Department of State and Department of Labor. As part of our effort to educate our clients and friends regarding immigration matters, we are providing general information about various visa classifications and related matters below. STEVEN G. TERAOKA is the Managing Partner of Teraoka & Partners LLP, a San Francisco based international corporate law firm specializing in domestic and international transactions. 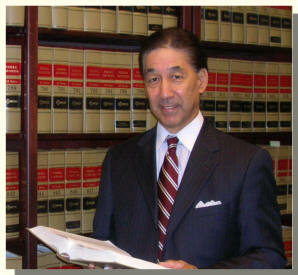 Mr. Teraoka has been practicing law for the past 36 years as both a business transactional and trial attorney. He now serves as a counselor and general counsel to multi national Japan and European based companies. Since 1988, he has been rated as an "AV" attorney, the highest rating for superior legal competence and ethics issued by the Martindale-Hubbell Directory, a worldwide compilation of attorneys. Mr. Teraoka has been recognized, and featured in the August editions of San Francisco Magazine as one of the Super Lawyers of Northern California for years 2008-2013. Mr. Teraoka was born in the Midwest, raised in Central California, and educated at the University of California at Berkeley and UCLA, graduating as a UCLA Bruin in 1970 with a degree in Economics. He was captain of the UCLA Karate Team and holds a Black Belt from the Japan Karate Federation. He obtained his law degree from Loyola Law School and did post-graduate studies work in international business transactions at Sophia University in Tokyo, Japan, in 1974. He has interned with the United States Securities and Exchange Commission, Western Regional Headquarters, and with a prestigious Beverly Hills entertainment law firm. His work at the Beverly Hills firm included handling various matters for motion picture celebrities and entertainment-related business ventures, which is where his experience in corporate securities regulation over various syndicated enterprises began. He worked as an associate with the San Francisco law firm of Burden, Reis, Eikan & Krinsky, a boutique law firm specializing in corporate securities, real estate, tax and litigation. Mr. Teraoka continued his work in corporate securities regulation and real estate, and during the economic downturn in the mid 70's, he developed litigation skills. Over the course of his career, Mr. Teraoka tried several jury trials, one of which included a six week jury trial in Los Angeles County involving franchise litigation, resulting in a favorable verdict of more than $450,000. He co counseled a 53 day jury trial regarding a complex international construction contract dispute in Alameda County, resulting in a favorable net verdict of $1.3 million. The latter involved a contract negotiated in Germany, drafted by an attorney in Tel Aviv, signed in Korea, performed in South Korea and Oakland, and applied California law. In addition to other trial work, Mr. Teraoka has tried bench cases, argued appeals to the Ninth Circuit Court of Appeals (BAP), and arbitrated and mediated numerous types of business cases, as well as tried administrative hearings before the California Public Utilities Commission. Mr. Teraoka's leading precedent-setting case in California was In Re Western Travel Plaza, a case before the California Public Utilities Commission that deregulated motor carrier transportation regulation covering sightseeing operations in California in 1980. This landmark case was appealed to the California Supreme Court by opponents including the California Bus Association and other major transportation carriers, and review was ultimately denied by then Chief Justice Rose Bird. The ruling achieved by Mr. Teraoka became law in California motor carrier regulation in sightseeing operations, and opened the way for tour bus carriers to competitively serve the Bay Area. Mr. Teraoka's initial calling has and continues to be in business, real estate, corporate and cross-border transactions, particularly between the United States and Japan. Utilizing his experience in the entertainment business, Mr. Teraoka has represented various business and advertising agencies from Japan that have used Mr. Teraoka's service and experience to procure licensing and merchandising agreements with American celebrities for commercial use in Asia. As an example, Mr. Teraoka has procured IP licensing rights from American entertainers and celebrities ranging from The Carpenters, Cheryl Ladd, Farrah Fawcett, Steven Spielberg, Sammy Sosa, to name a few, all in cross-border licensing and commercial endorsement engagements in Japan. Mr. Teraoka has a broad, diverse background in legal matters, with the added involvement in cross-border issues, which makes his experience unique and advice valued by larger growing businesses. He is currently outside general counsel for Kikkoman Sales USA, Inc. and JFC International Inc. (formerly Japan Food Corporation). The firm has performed work related to Japanese anim and the Pokmon phenomenon, helped Sega in business acquisitions, assisted Nomura Research and its U.S. affiliates in corporate structuring, and has negotiated TV agreements to broadcast LPGA tournaments in Japan.